Few days ago I was discussing with some commenters on the blog of aviation analyst Scott Hamilton (Leeham News and Comment) about the recurring costs Boeing may be experiencing in the 787 program at the moment. I used in the discussion the analysis I had made of the learning curve Boeing has experienced in the last 2 years according to cost reductions reported by its CFO, Greg Smith. See a post I wrote about it here. The result I reached is that lately they achieved a 87%. With information disclosed last year, the figure I arrived for 2013 was ~84%, see the post here. However, in the calculation to obtain the learning curve experience the actual costs are not needed, it is sufficient to know cost reductions achieved (reported) between given units. However, when in 2011 I wrote a series of posts (1) about Boeing 787 break even, I did try to estimate what the cost of the first production units were using published information at the time. At that time it was disclosed that Boeing had about 18bn$ of work in process (WIP) and a number of aircraft in different stages of production. Reported average costs ranged from 250m$ to 400m$. I made some simple assumptions and arrived at an average cost of 310m$ for the first ~60 units. 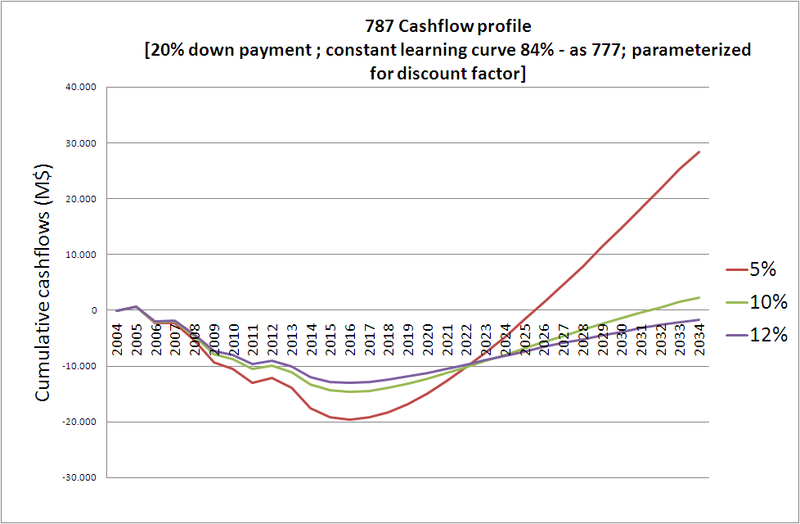 The next step is to accommodate those average costs into a learning curve profile. The steeper the curve (75%) the more expensive the first unit would have been. Since in 2013 the calculated curve was a 84%, I obtain that the first must have been around 650m$ (2). From then on, I apply the mentioned 84% through end 2013. 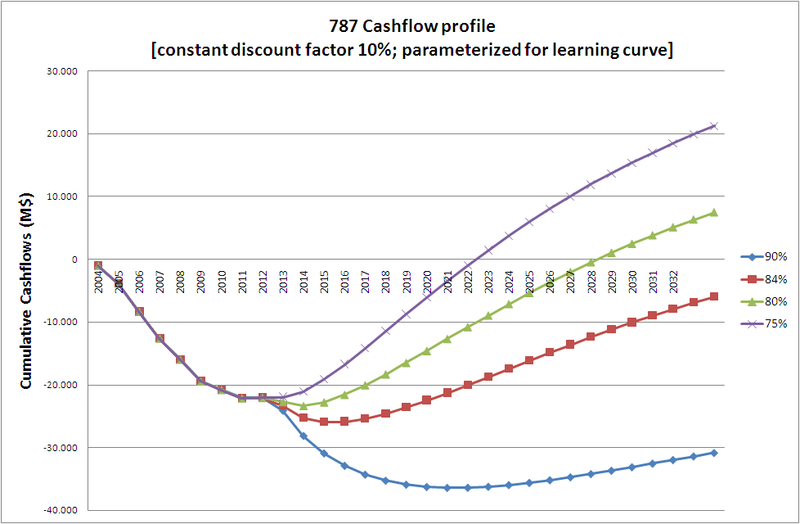 Then I switch to a 87% curve (slower learning) following the reported figures from Greg Smith. This discussion so far gives an idea of how to estimate the recurring costs. At the end of 2014 this figure is estimated around 180m$. In order to know by when Boeing will turn the production of 787s into something profitable, we first need to know by when the recurring costs will be lower than the recurring income. The latter is estimated from the information about prices (published by Boeing here) and discounts applied (estimated in other blog posts, see the last update for 2014). Boeing list price for the 787-8 in 2014 was 218.3M$. These list prices are, however, increased almost on a yearly basis by Boeing. Sometimes very steeply (+11.4% in 2010, from 2008) and other times more moderately (+2.4% in 2013 vs. 2012). Going into the future I assumed this increase to be constant and about equal to 2014′ increase, 3%. On the other hand, Boeing applies some discounts to its customers. These are never disclosed. Some are reported by some sources. What I do is to try to estimate an average discount from reported information. See a detailed calculation here. The latest figure that I arrived at was about 47%. Going into the future I assumed this discount to remain constant. You can see here the recent evolution of discounted 787-8 prices. 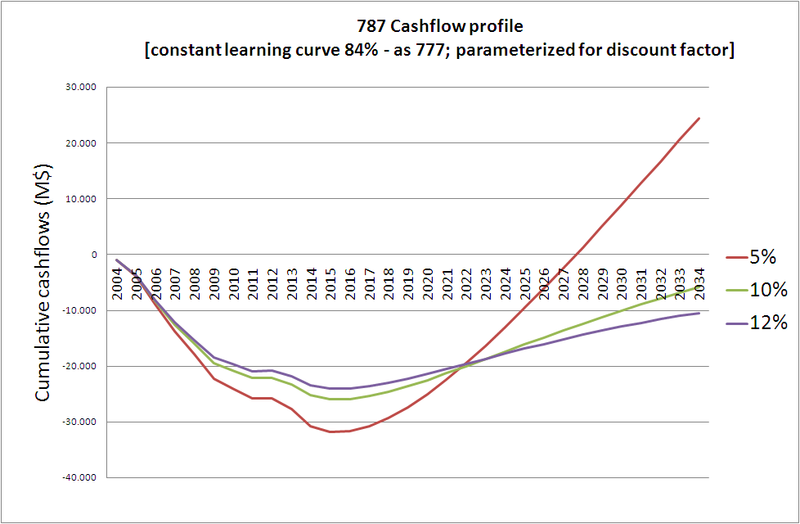 787 recurring cost vs. recurring income evolution. As you can see recurring costs may be lower than recurring income at the end of 2019. This will truly depend on the learning curve achieved, the number of units produced (3) and the pricing power Boeing manages to have. If the learning is steeper, the date will be sooner. If the ramp up is higher, the date will be sooner. If the discounts are lower or the list prices increased more, the date will be sooner. In any other case, either 2019 or beyond. (1) See the complete series here: “Will Boeing 787 ever break-even?“, “More on Boeing 787 break even” and “787 Break Even for Dummies“. (2) We will never know that figure. I wonder whether this is even known or registered (if not deleted and forgotten) within Boeing. (3) For the numbers of units built I based the model in reported information that the ramp up to 12 aircraft per month is expected for 2016. I assumed that in 2015 they are at somewhere between 10 and 12 aircraft per month. Boeing does not disclose outright what is the actual learning curve it is achieving in its program. Nevertheless, in its investor relations conferences it provides information here and there of cost savings achieved, etc. This can be interpreted as derived from learning curve effects, and would permit to build a model, even if based on scarce information. As I mentioned last year, to the avid reader, and knowledgeable and savvy analyst, this paragraph is enough to deduce an actual learning curve achieved by the 787 for each aircraft model, provided that information reported by Boeing CFO, Greg Smith, was accurate. Greg Smith is mentioning a cost reduction of 30% over the last 175 deliveries. As he was talking at the 2014 earnings call, we can safely assume that the figures were put up for him using deliveries and costs only through the end 2014 (and not counting info from January 2015 deliveries). That means that the cost improvements are measured theoretically from the aircraft 37th through the 212th (175). You can extract a report from Boeing website of the complete 787 deliveries here. I did it. Analysing it you see that between the beginning of December 2012 and the end of December 2014 176 787-8 were delivered (1). Thus, the exercise to find out what learning curve Boeing achieved during that time span is as simple as to see what learning curve yields an “approximately 30% unit cost improvement” from the unit 36th (2) to the unit 212th. The beauty is that we do not even need to know the initial unit cost to perform the calculation, as the relative improvements in terms of percentages are independent of the starting point. All the information has indeed been provided by Boeing. As I did in the blog post of the last year, in this first graph below I just plotted some generic learning curves, from 95% to 75%. This form of representation provides a good view of how learning is intense at the beginning of the production process and it stabilizes later on. 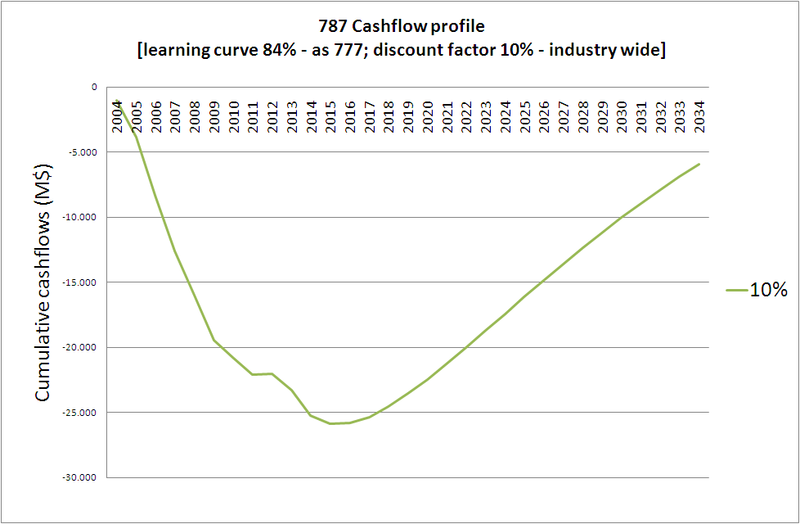 It also shows well how learning is more intense and cost reductions are bigger for a 75% curve than for a 95% curve. 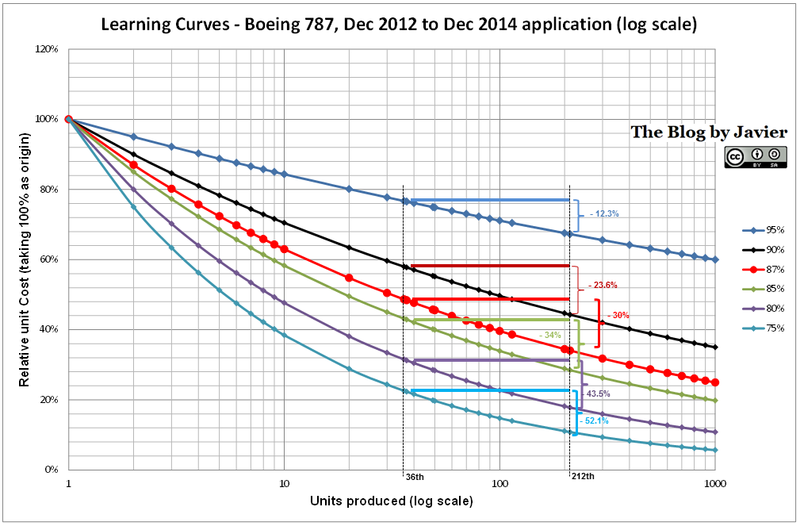 Boeing 787 learning curve over 176 units through Dec 2014 calculation, delta unit cost between 36th & 212th units. In this second graphic I added the information of what relative cost reduction is achieved between the 36th and the 212th units for each of the curves (3). Thus, from the information provided by Boeing of units delivered and unit cost improvement (“approximately 30%″, Greg Smith) we can deduce that from December 2012 through December 2014 the average learning curve that the 787 program has achieved is about 87%. Thus, in line with aerospace average indicated by NASA (85%), or in line with the reported 84% achieved in the 777. Though a bit lower than that calculated for 2013 (see here last year’s post). We can interpret that mismatch as either as a minimum error inherent of these estimates (85% vs. 87%) or that indeed the rate of improvement has somehow slowed down in 2014 in comparison to 2013. Had Boeing been able to achieve effectively a 85% curve in the last 175 deliveries, bear no doubt that the message from Greg Smith would have been along the lines of an approximate 35% cost reduction (being the mathematical result 34%), instead of the reported 30%. All these numbers refer to the 787-8. 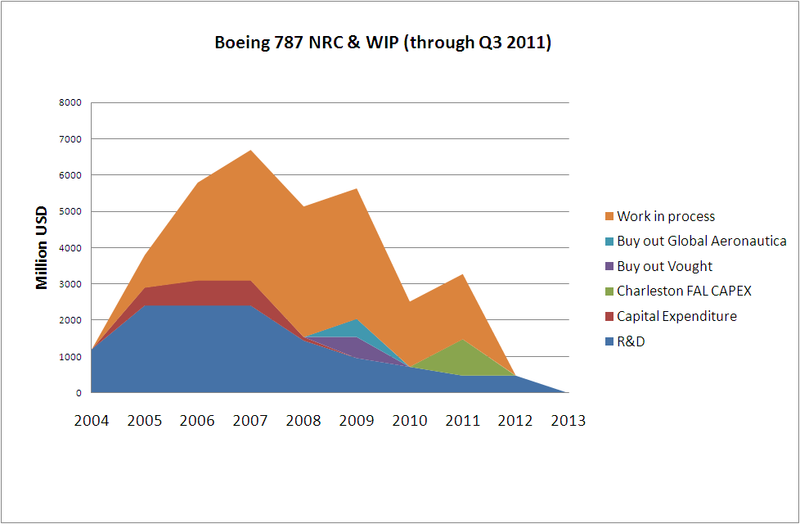 Now, remember that Boeing CFO also indicated that “on 787-9, we’ve seen declines of 20% since the first delivery”. Here, the calculation that needs to be done is the same. 787-9 deliveries started in 2014. If we assume that Greg’s comment referred only to 2014 deliveries (not 2015 ones), then the calculation must be made on 10 787-9 delivered between June and December 2014. Here the learning curve obtained is a 93.5% ~87-88% (5) (6). (2) Taking into account the note (1), I will use 176 aircraft and deliveries from the 36th aircraft through the 212th. (3) Bear in mind what a relative cost reduction is in contrast to the fact of relative costs represented in the vertical axis as percentages of the initial cost (100%). (4) The taking of 175 instead of 176 aircraft practically does not change the result. For the same 87% curve the calculated cost reduction in one case is 30% and in the other 29.6%. (5) This is in line with the slow down of the learning curve for the 787-8 comparing 2013 result with the result along the time span December 2012-December 2014. (6) I initially calculated 93.5% as a result of a 20% cost reduction between the 1st and 10th units produced. However, as Matt B pointed, the first 3 787-9 have not been delivered (though they are units produced from which there was a learning effect). When you calculate what is the result for a 20% cost reduction between units 4th and 13th (the first 10 delivered), you get a curve between 87-88%, more or less the same one than for 787-8. Thus, it seems than at the beginning of the 787-8 production they went along a 85% curve that has slowed to a 87% for both models. “We continue to see progress in key operational performance indicators and unit costs, as we further implement production efficiencies and stabilize the overall production system on the 787 program. Unit cost has improved approximately 20% over the past year on the 787-8 […]“, Greg Smith, Boeing EVP – CFO at Q4 2013 Earnings Conference. To the avid reader, and knowledgeable and savvy analyst, this paragraph is enough to deduce the actual learning curve achieved by the 787 during 2013, provided that information reported by Boeing CFO, Greg Smith, was accurate. During 2013 Boeing delivered 65 787s, from the 50th to the 114th units (in previous years it had delivered already 3 in 2011 and 46 in 2012). 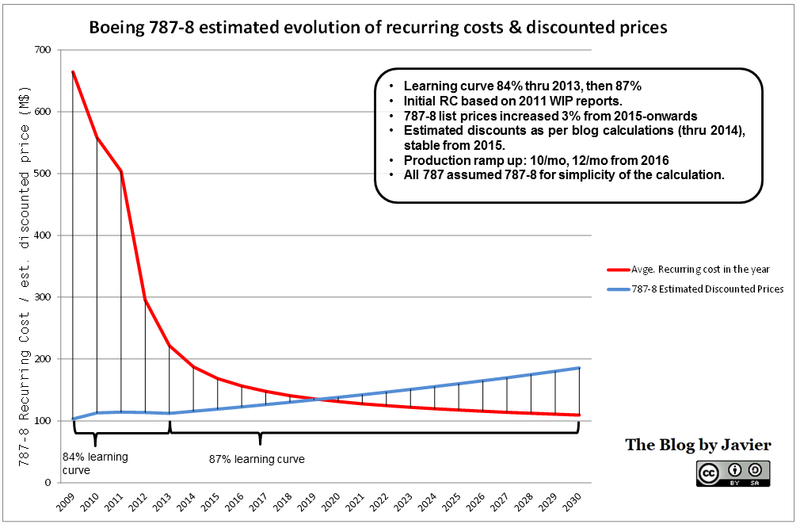 Thus, the exercise to find out what learning curve Boeing achieved in 2013 is as simple as to see what learning curve yields an “approximately 20% unit cost improvement” from the unit 50th to the unit 114th. The beauty is that we do not even need to know the initial unit cost to perform the calculation, as the relative improvements in terms of percentages are independent of the starting point. All the information has indeed been provided by Boeing. 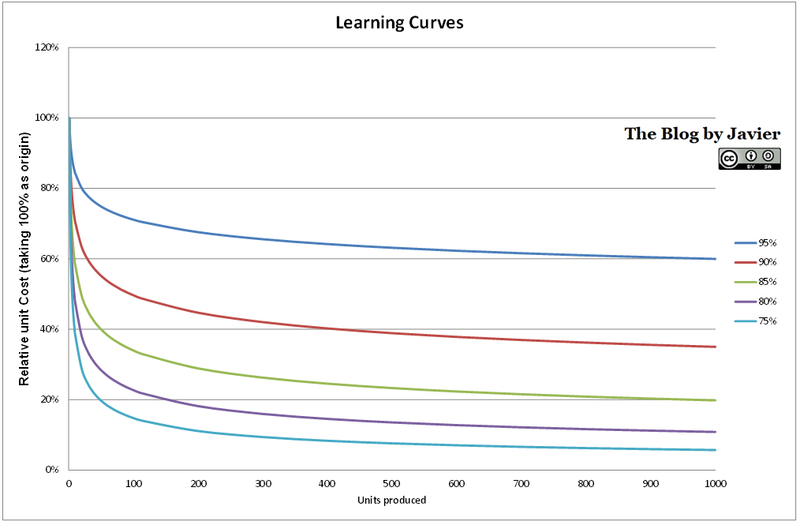 In the first graph below I just plotted some generic learning curves, from 95% to 75%. This form of representation provides a good view of how learning is intense at the beginning of the production process and it stabilizes later on. 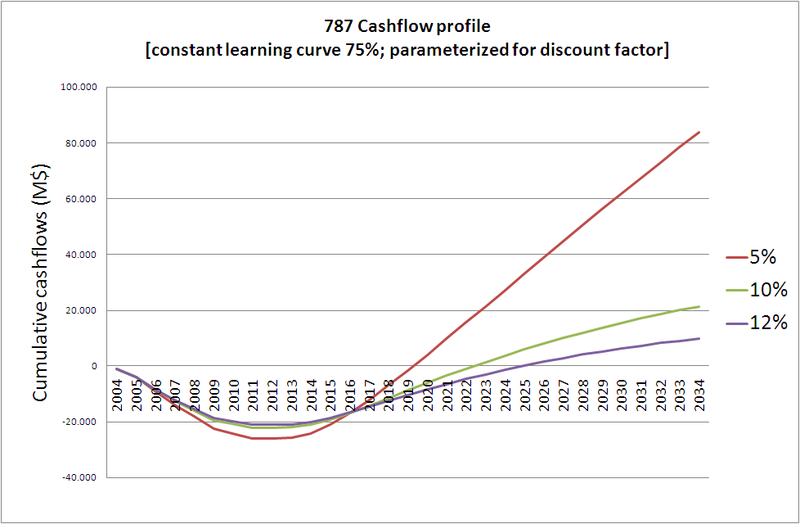 It also shows well how learning is more intense and cost reductions are bigger for a 75% curve than for a 95% curve. 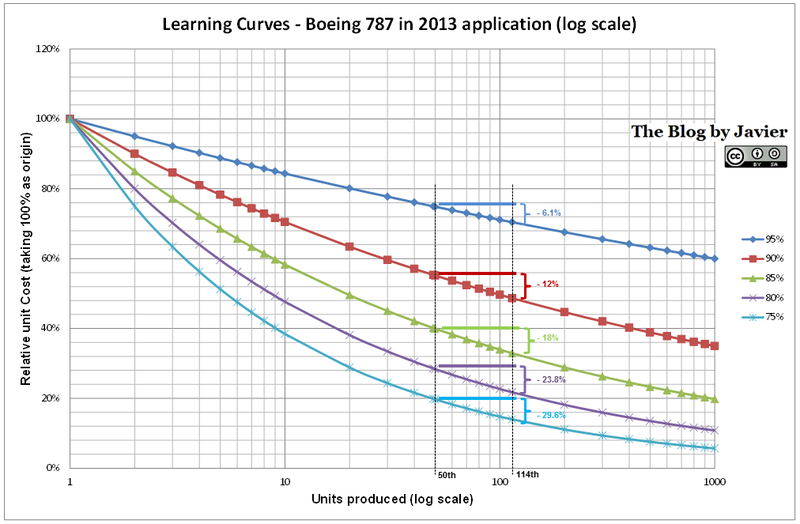 Boeing 787 learning curve in 2013 calculation, delta unit cost between 50th & 114th units. In this second graphic I added the information of what relative cost reduction is achieved between the 50th and the 114th units for each of the curves (1). Thus, from the information provided by Boeing of units delivered and unit cost improvement (“approximately 20”, Greg Smith) we can deduce that during 2013 the learning curve that the 787 program has achieved is between 85% and 80%. Thus, in line with aerospace average indicated by NASA (85%), or in line with the reported 84% achieved in the 777. 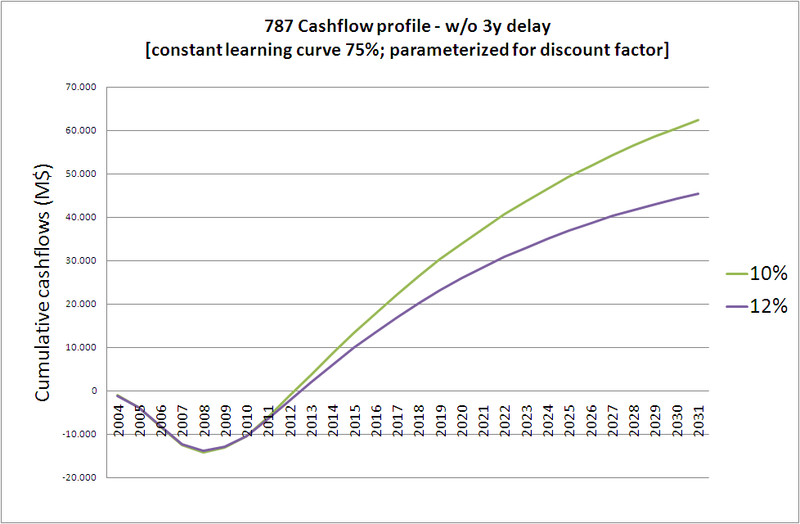 If we wanted to know what learning curve yields exactly that 20% unit cost improvement, it is now trivial to calculate it: the 83.3% learning curve. Having made these numbers, and taking into account the words used by Boeing CFO, “unit cost has improved approximately 20% over the past year on the 787-8″, I take it as that the improvement has been close to 20% though probably not reaching it; thus, I understand that the learning curve was rather between 83.3-85% instead of down to 83.3%. (1) Bear in mind what a relative cost reduction is in contrast to the fact of relative costs represented in the vertical axis as percentages of the initial cost (100%). I used the concept of learning curve in a blog post in which I discussed whether and when the Boeing 787 would break even. In that post I referred to Boeing’s target of reaching a 75% learning curve on the 787 program, much more difficult to reach than the 84% that Boeing reportedly achieved in the 777 program. Why is a curve of 75% more difficult to achieve than a 84% curve? The meaning of the figure “84%” attached to the learning curve is that each time that the number of units produced is doubled, the cost is reduced in 16%, or the 2*nth unit cost is 84% of the unit cost of the nth unit. Thus, a 75% curve would imply that the cost is reduced in 25%, which is a higher cost reduction than 16%, and, thus, more difficult to achieve. Experience curve (from Wikimedia, by Apdevries). 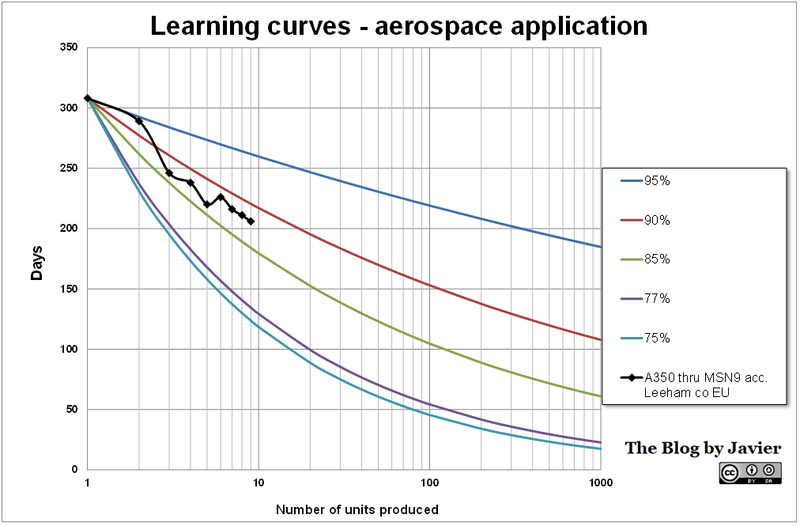 The concept of learning curve is indeed used in aerospace, however, coming back to the 787 program, Boeing does not disclose outright what is the actual learning curve it is achieving in its program. Nevertheless, in its investor relations conferences it provides information here and there of cost savings achieved, etc. This can be interpreted as derived from learning curve effects, and would permit to build a model, even if based on scarce information. “We continue to see progress in key operational performance indicators and unit costs, as we further implement production efficiencies and stabilize the overall production system on the 787 program. Unit cost has improved approximately 20% over the past year on the 787-8 […]”, Greg Smith, Boeing EVP – CFO at Q4 2013 Earnings Conference. “[…] as we continue to make improvements 787 unit cost […]”, Greg Smith, Boeing EVP – CFO at Q4 2013 Earnings Conference. “when you look at flow-time, you look at unit cost at Charleston whether it’s final, mid, or (aft) it made great progress there. And the team has been very focused on continuing that progress going forward. We have experienced a higher number of jobs behind schedule in the mid-body section, and that’s really due to, if you think about it, you are introducing the Dash-9 at the same time going to 10 a month. […], we’ve applied additional resources. We know how to do this and we’ll get those jobs back to what we view as a more acceptable level. So we got mitigation plans.” Greg Smith, Boeing EVP – CFO at Q4 2013 Earnings Conference. “This morning we announced plans to increase 787 production beyond the 10 per month we’re on track to achieve this year to 12 per month in 2016 and then 14 per month, before the end of the decade. […], capture productivity and learning improved profitability […]” Jim McNerney, Boeing Chairman, President and CEO at Q3 2013 Earnings Conference. “We’ve added another line or sorry, a position within the line, where we’re doing the wing, body joint earlier in the process and this is through experience after 134 airplanes, the teams are really coming up with better ideas or improvements on how to increase flow and that’s going to require some upfront investment. But obviously in the units to come after we’ll see that improvement again in flow and productivity.” Greg Smith, Boeing EVP – CFO at Q3 2013 Earnings Conference. “[…] the flow time reductions, we’ve had in our factories, the hours per unit, the productivity per whatever are increasing significantly on all of our programs.” Jim McNerney, Boeing Chairman, President and CEO at Q3 2013 Earnings Conference. After the post I wrote the last week with an analysis of when could Boeing 787 break even (Will Boeing 787 ever break even? ), I received some feedback in the form of emails, comments in the blog and comments in Scott Hamilton’s blog (Leehamnews) as he mentioned the analysis and linked to it. I wanted to address some of those comments in a single piece for the benefit of all. Please, find them below. This could be built into the model by allowing aircraft sold after the current backlog appear in the model as sold at a lower discount (e.g. 20% instead of 38%). The cash inflows due to the down payments would be increased soon, but since producing the existing backlog will take until sometime in 2019, the cash inflows from deliveries will be untouched until then. Result: that would bring break even about 2 years forward (2021 vs. 2023, in the case of 75% learning curve and 10% discount rate – what I would call “Boeing’s baseline”). I reviewed Boeing’s commercial market outlook. In the next 20 years (2011-2030) Boeing sees deliveries of 6,610 twin-aisle passenger aircraft: 3,020 small and 3,590 intermediate. In the previous post I mentioned that 2,634 were included as 787 deliveries, though that includes deliveries from 2031 to 2034, later than the period covered by this year’s CMO (480 a/c between 2031-34). To compare apples with apples, between 2011 and 2030 I included 2,154 787s delivered, all those that 787 assembly lines could produce. That is 43% of the “addressable” 5,000 market or 33% of the 6,610 total market, including A330s, 777s (70-90 produced a year now), 767s (12-15 a year) and A350s… This figure, 2,154, could be optimistic in my opinion as well. If a lower figure should be used the situation for the break even would be worse. Those are the ~18bn$ I mentioned, which were mentioned in the conference call as well. We need to distinguish here between accounting and cash flows. For the accounting of the profit behind each aircraft, it may be true that unamortized tooling could be distributed among 1,100 aircraft, however all those are costs that have already meant an outflow of cash. What I tried to do is to see how much costs of the about 50 aircraft which are in different stages of production was included in those 18n$ in order not to double count cash outflows related to costs of aircraft delivered. In other words, if from those 18bn$, 1.8bn$ refer to tooling and shouldn’t be distributed as WIP of those ~50 aircraft, that means the cash flow profile would look even worse, not better. That’s correct and I acknowledge this is a shortcoming of the model. I tried to base all assumptions in public references appearing either in Boeing’s website or reports or news in the media. I couldn’t find anything related to value and structure of those penalties and thus didn’t include them. I would welcome references regarding this point. Anyway, as it was mentioned, including penalties in the model would worsen the cash flow profile and delay break even. “If the Leontieff assumption in equation (2) were relaxed and instead production was assumed to be Cobb-Douglas in all inputs, the production only at the unit level would imply a labor-requirements equation similar to (4) with the addition of both the wage rate and materials prices […]”. If this assumption was optimistic or if the learning related to the materials production was capitalized mainly by Boeing’s suppliers and not by Boeing itself, this would only make the cash flow profile worse and delay the break even date. I do not give stock recommendations. 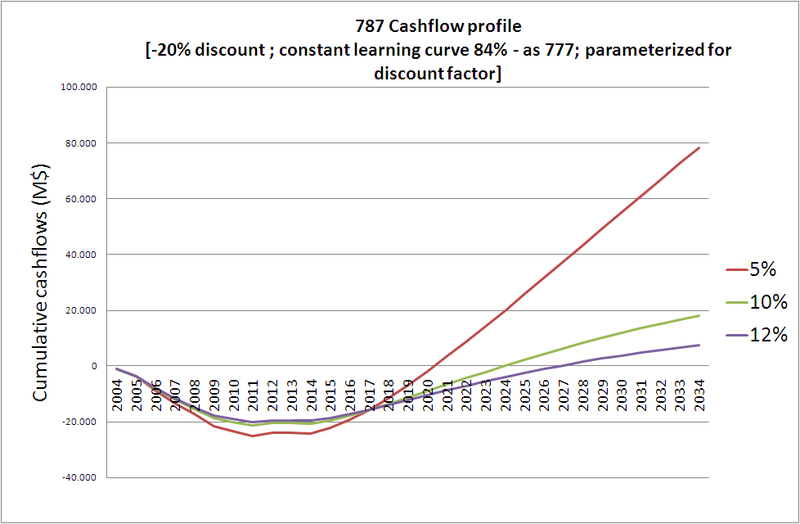 Anyway, this cash flow analysis shows that most of the cash outflows that make the case of the 787 (viewed in isolation) such difficult, were made in the past years and didn’t derailed Boeing then. The 787 development was supported by other Boeing programs. 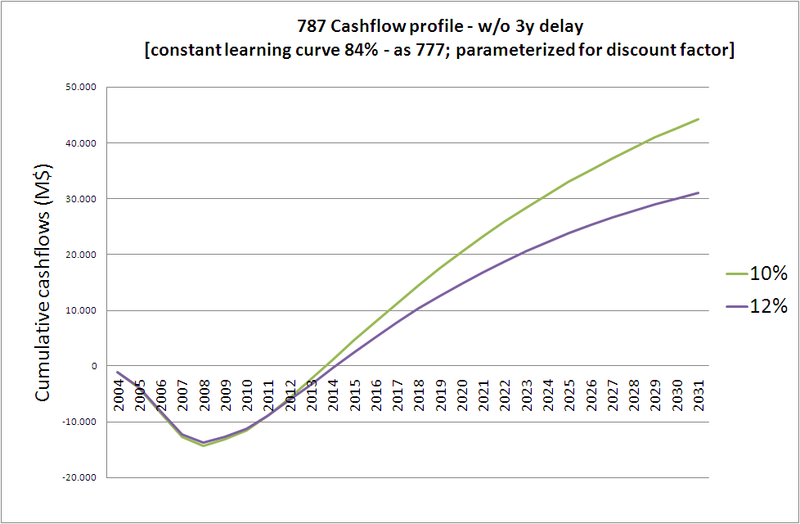 From now on what is missing is that unit production cash outflows are lower than cash inflows related to deliveries (penalties not taken into account), and that is something that should happen at sometime between 2014 and 2016, depending on the learning curve that Boeing achieves. Nevertheless, whether this is something already reflected or not in current Boeing price share, and whether this price is cheap enough or not is left to the individual investor. Finally, thanks again for all your feedback, comments, criticism and especially to Scott Hamilton for his linking the post so that I could get more feedback.